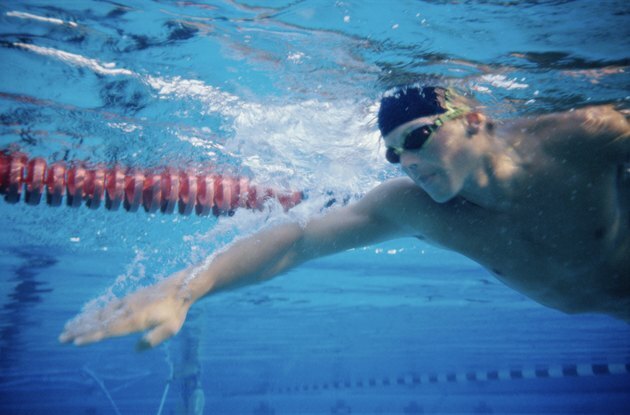 Nasal congestion following swimming is not uncommon. If you are swimming in a pool and experience nasal congestion, you may be sensitive to the chemicals added to keep the water clean. If you experience problems following lake or ocean swimming, water may have entered your nose and nasal passages, which can result in inflammation or infection. Proper swimming hygiene is essential. Pre- and post-swim showers with soap and water should be mandatory at the facility where you swim. If you swim at an indoor pool, it should have good ventilation to help reduce the presence of chemical vapors from chlorine and other water sanitizers. A nose clip will effectively stop your from inhaling water if you often get water in your nose. The clip will also help protect your nasal mucosa from exposure to chemical irritants. Try saline, cromolyn sodium or steroid nasal spray to reduce symptoms of congestion. Also consider using oral decongestants or antihistamines if you are allergic to pool chemicals. Seek guidance from your health care provider to help determine what is best for you.